Coldwater, MI: There has been a demand in the market for a better riding, better performing suspension system for the 2001-2010 Chevy/GMC HD trucks. With many of these trucks still on the road, BDS Suspension has developed and is excited to announce the release of new upgrade options for the torsion bar IFS converting over to premium quality FOX 2.5 factory series DSC coilovers. Available in 4.5" and 6.5" lift heights, these new coilover conversion systems are based on BDS's tried and true high clearance IFS systems, now integrating FOX's coilover technology gathered from extensive testing. Similar to the widely popular coilover conversion systems offered for the late model 2011-2018 HD's, these new coilover conversion systems bring next level performance, capability, and ride quality to the 2001-2010 Chevy/GMC HD platform with room for up to 37" tires. 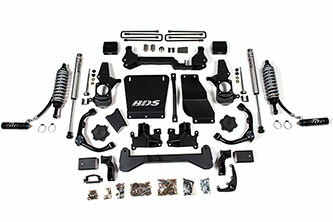 Get more out of your HD with these new coilover conversion systems from BDS and FOX. 4.5"/6.5" Coilover Conversion Systems - Ever since the launch of BDS Suspension's coilover conversion systems for late model (2011+) Chevy/GMC HD trucks there has been a huge demand in the aftermarket for similar options for the earlier 2001-2010 HD trucks and SUVs. BDS answers that call with new 4.5" and 6.5" high clearance coilover conversion systems engineered for next level performance. These kits build on the BDS high clearance system technology offering increased ground clearance and improved suspension, steering and driveline geometry and pairs it with the race proven pedigree of FOX 2.5 factory series coilovers to soak up the harshest terrain and on-road comfort. At the heart of these systems you'll find the FOX 2.5 factory series coilover with remote DSC reservoir. These coilovers feature a smooth bore and honed seamless alloy body, 7/8" hardened stainless steel shaft, FOX coil springs, black anodized machined 6061-T6 billet aluminum mounts and FOX's DSC (dual speed compression) adjustment technology. The DSC adjustment allows for easy adjustment of the vehicle’s suspension compression damping to dial in the ideal ride performance to soak up the bumps, both large and small. The DSC has 12 adjustment points for the high speed compression as well as 10 adjustment points for the low speed compression allowing you to make large or small changes to further improve your performance on any terrain. Adjustments can be made by simply twisting the "blue" high speed and "gold" low speed compression knobs located on the end of the remote reservoir of the FOX 2.5 coilovers. No tools or shop adjustments needed, allowing you to tune the suspension out on the trail. The coilovers come fully assembled, preset for either 4.5" or 6.5" of lift for optimal wheel travel. 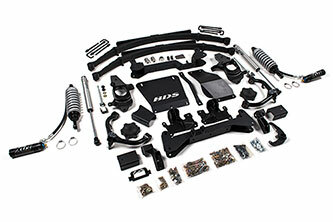 To mount the coilovers BDS supplies a bolt-on bracket that installs on the frame in the shock mount location. A weld-in support gusset is used to reinforce the upper mount, however still allows the kit to be completely reversible if the owner ever chooses to revert back to the torsion bar style suspension and upgrade the suspension on another truck. In addition to replacing the factory torsion bars, the upper control arms (UCA) are upgraded to improved strength, travel, and accommodate the new coilovers. The uppers are new performance series upper control arms designed specifically for this system to integrate with the 2.5 coilovers. The arms are fabricated from large 1.5" OD x .120-wall tubing, fully welded and gusseted for the highest quality, strength and durability. The arms utilize premium Moog brand ball joints and factory style rubber bushings for smooth, quiet operation and superior durability when compared to arms with uni-balls, poly bushings or heims. The ball joint cups are repositioned for optimal performance allowing for improved suspension travel. These upper control arms are finished in a durable black powdercoat and include a billet aluminum ball joint dust cap. The control arms come fully assembled for easy install right out of the box. The factory cast steel lower control arms are retained with the addition of a robust lower coilover mounting bracket. Along with the coilover conversion, these 4.5"/6.5" coilover systems includes a pair of one-piece laser cut high clearance crossmembers, CNC machined ductile iron steering knuckles to correct steering angles, heavy duty front skid plate and differential skid plate to increase protection, multipoint differential relocation brackets to secure differential and correct CV axle angles, CV spacers, and longer sway bar links. In the rear, these kits are designed to level the stance to the front. 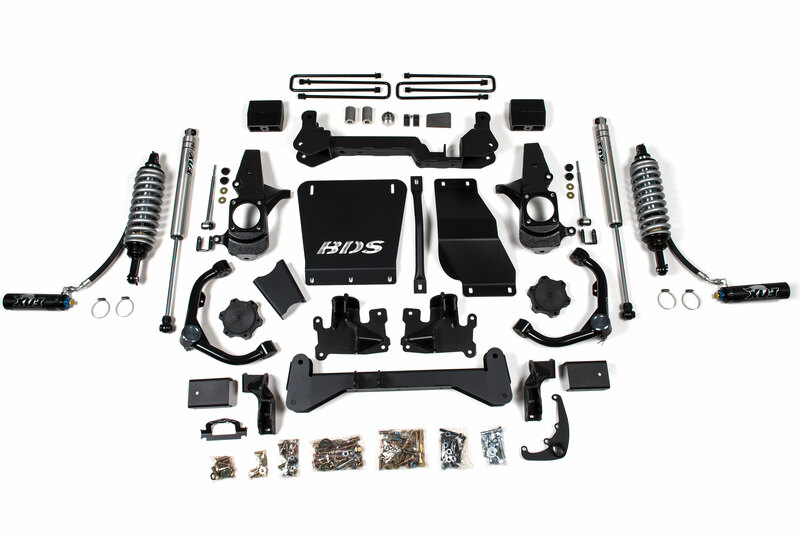 BDS offers a 3" rear block kit for the 4.5" systems while the 6.5" systems are offered with your choice of 5" rear block kit or replacement GlideRide leaf springs. The leaf springs have additional arch built into the 5-leaf pack and integrates an overload leaf into the pack to assist with hauling heavy loads. 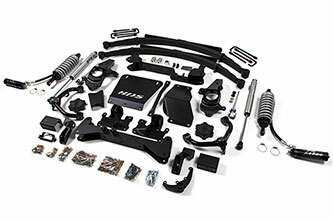 All kits include black e-coated u-bolts along with FOX 2.0 performance series IFP shocks to round out the package ready to offer impressive performance wherever your the adventures lead you. The 4.5" system are designed for fitment of 35" tires while the 6.5" kit allows fitment of 35-37" tires. 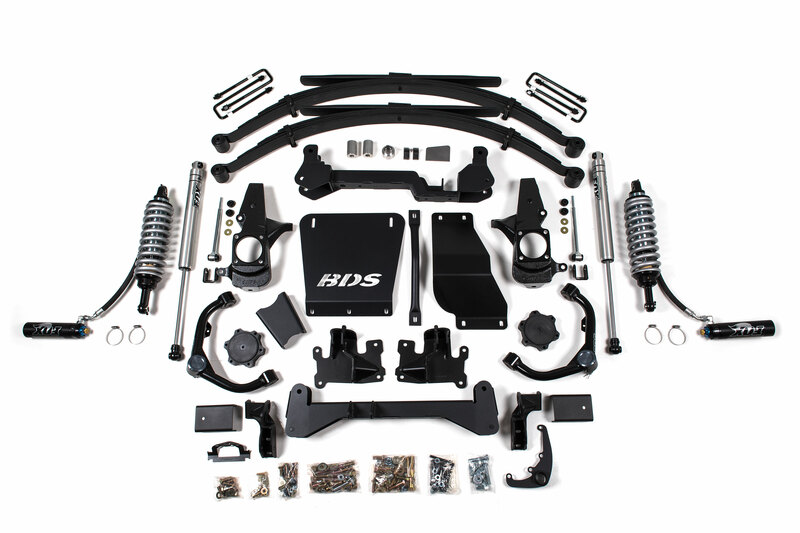 If you're looking to get more out of your 2001-2010 Chevy/GMC HD truck or SUV look to BDS Suspension and the new 4.5"/6.5" Coilover Conversion Systems. 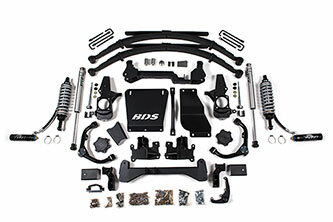 Head to the BDS website for more info and stop by your local BDS distributor to take your HD to the next level! Hi I’m from Australia and have a 2003 chev Avalanche, I’ve been looking for a lift kit for it here but no one does them in Australia. I’ have seen your 4 1/2 and 6 inch coil over kits that I’m very interested in. Just wondering if you import to Australia and whether the kit would work after the truck being converted from left-hand drive to right hand drive to comply with Australian standard . Currently we don’t have any distributors set up in Australia and don’t offer international shipping on retail orders. Your options to purchase a kit would be (A) go through a current BDS dealer willing to ship internationally (http://bds-suspension.com/distributor-lookup) or (B) work with a freight forwarder that can provide you with a US ship-to location to deliver the order. I recently purchased a 2018 Chevy Colorado ZR2, and I was hoping to get a lift. I know the issue lies in the dssv shocks that come stock with the ZR2. However, I heard a rumor that you may be working on something to integrate those shocks? Is this true? If so that would be badass and do you know when it would be available? Thanks for reaching out and your interest in BDS Suspension. The rumors are true, we are have some kits in the working for Colorado ZR2, however as a company policy we can’t get into kit specifics, pricepoint, or expected release date. As kits hit the shelves ready to ship we’ll send out announcements and officially begin promoting. Keep an eye out on our website and social media sites for upcoming announcements. I need a 6″ suspension lift kit for a 2002 chevy silverado 1500hd 2wd can y’all help me out with that let me kno asap. Carter, in regards to rear suspension. I know you offer blocks or leafs. Does one provide a better ride quality? Hey Jonathan, both rear options (lift blocks or replacement springs) are will offer good on/off-road ride quality. That said there are benefits to each option. The lift blocks are less expensive, but are more susceptible to axle wrap during hard acceleration. With the replacement leaf springs we build more arch into the spring to eliminate the need to use a lift block as well as include an overload leaf to help with additional load capacity. Hi Carter, are those upper coilover mounts available to purchase separately? I believe they are parts #0397 & 0398 from box 121654. I have a 10” lift on my truck and want to convert to coilovers. Box Kit #121654 has the frame and LCA mounting brackets and hardware, we don’t list it online, you would have to call our sales team or head to your local BDS dealer to order. I have a 2009 2500hd duramax 4×4. I tow a 40ft grand design bumper pull and a 22ft v-nose. The 40ft is about 13k and the 22ft is about 9k. Will this system give me the comfort and capability I am looking for with out sacrificing my ride when not towing? I am also running load lift 5000 air bags which have been amazing.